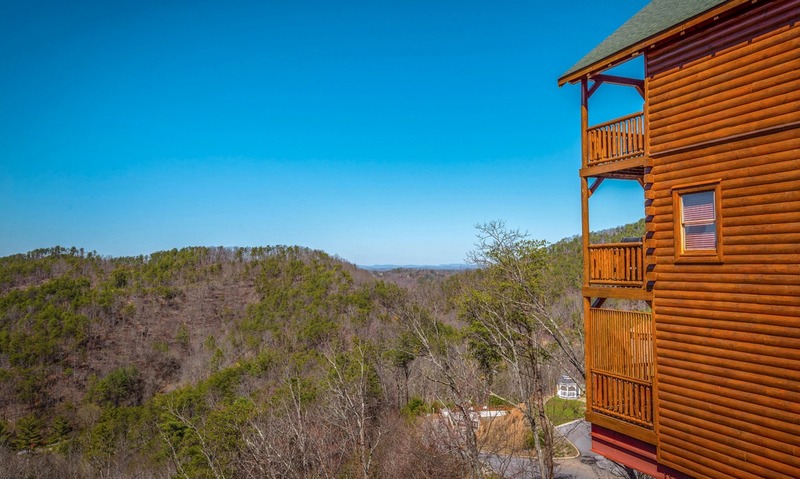 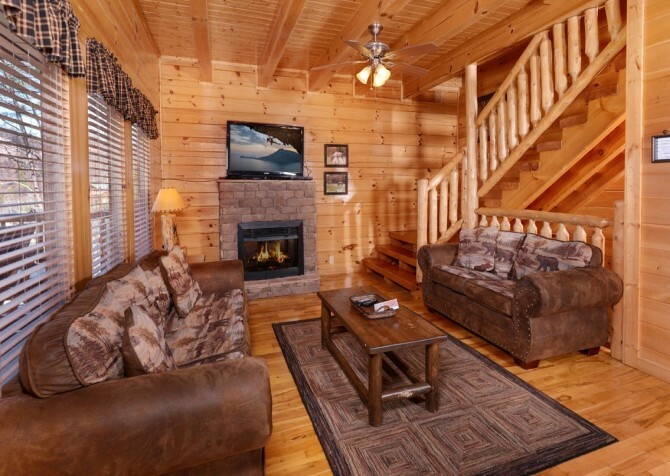 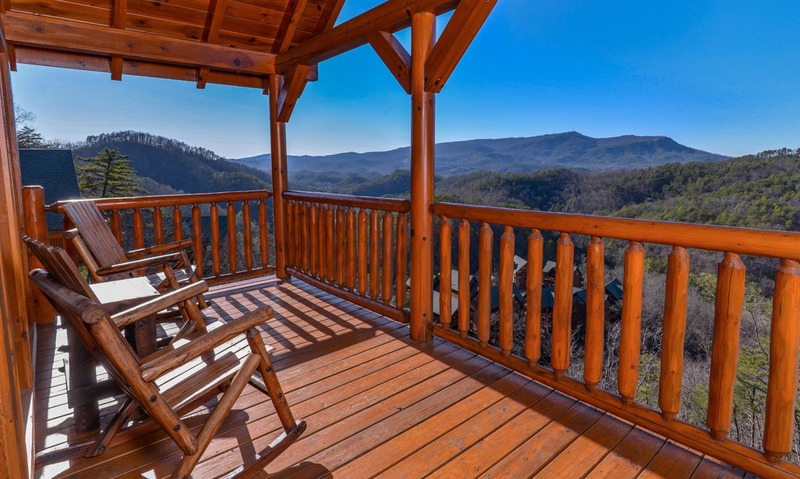 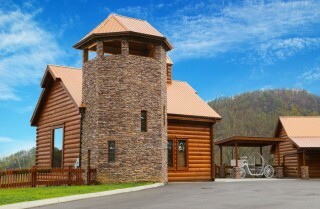 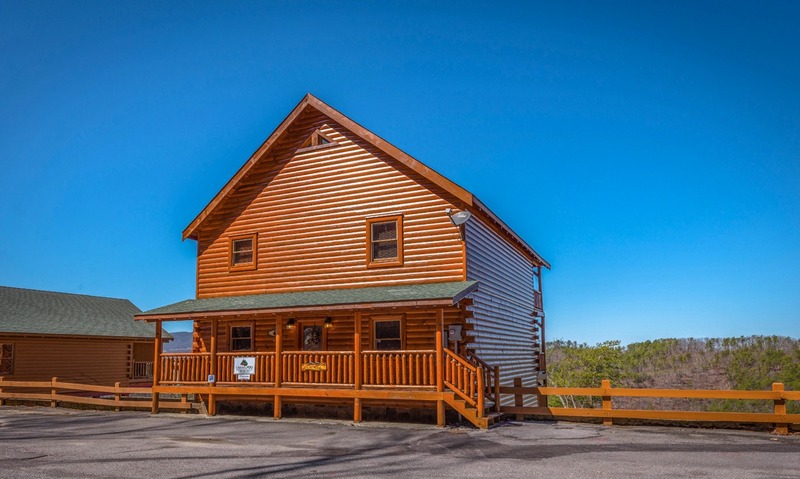 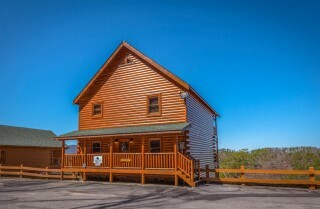 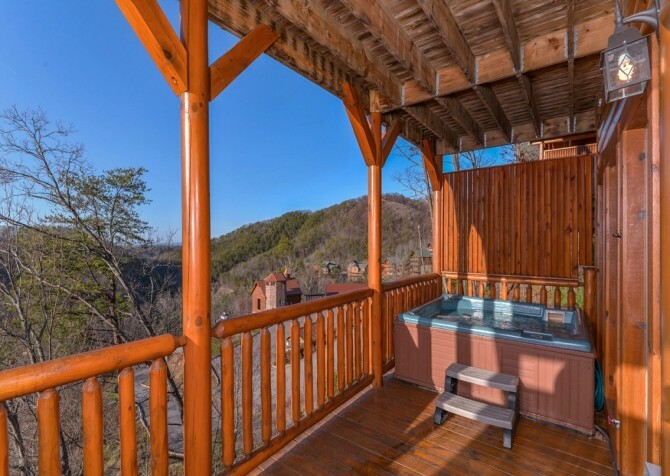 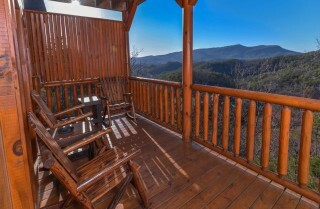 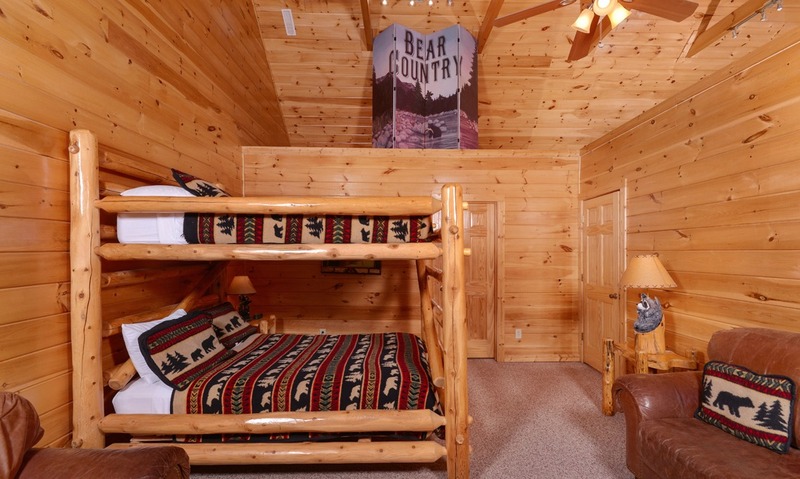 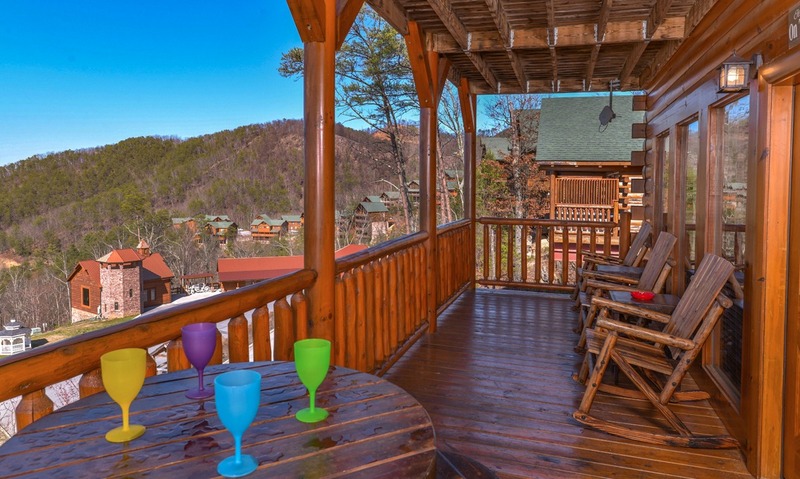 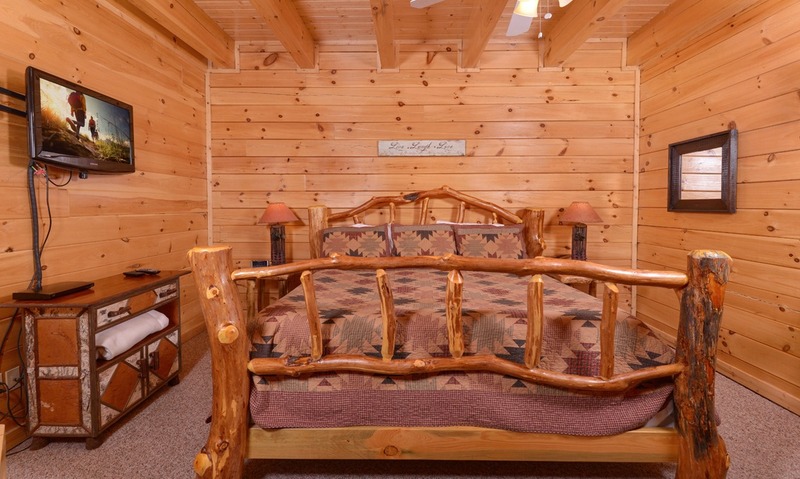 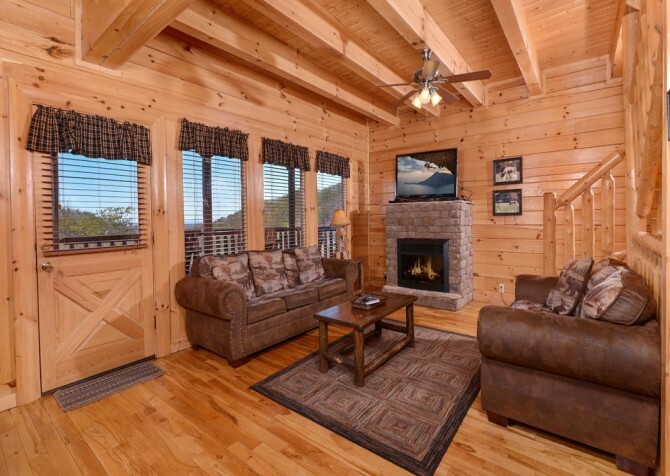 Whether you’re looking to escape from hectic times or simply wish to stay at a lovely place on your incredible Pigeon Forge vacation, this 3-story, 4-bedroom, 4-bathroom cabin in Pigeon Forge won’t disappoint. 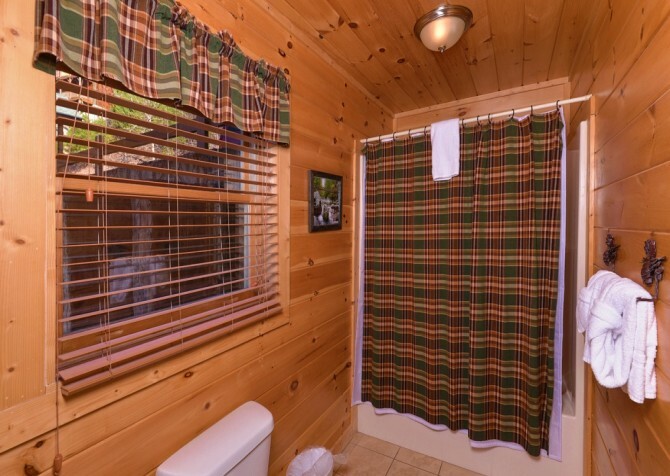 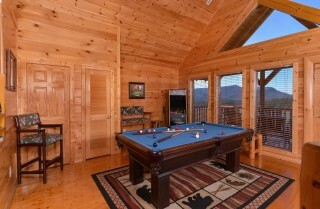 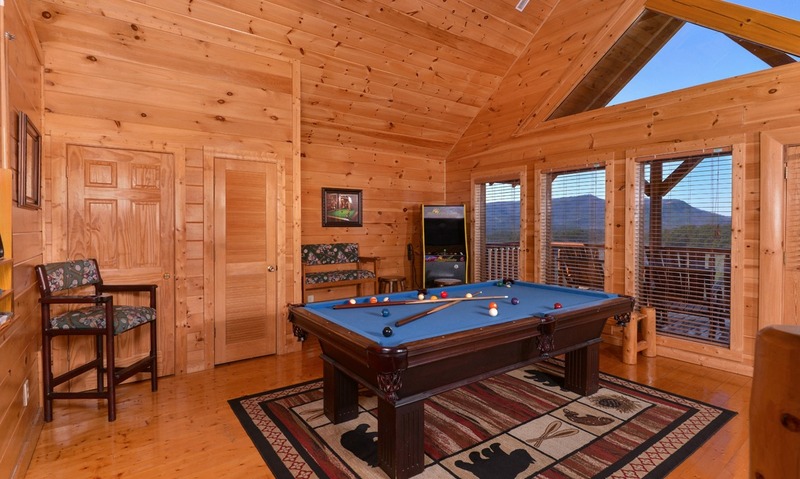 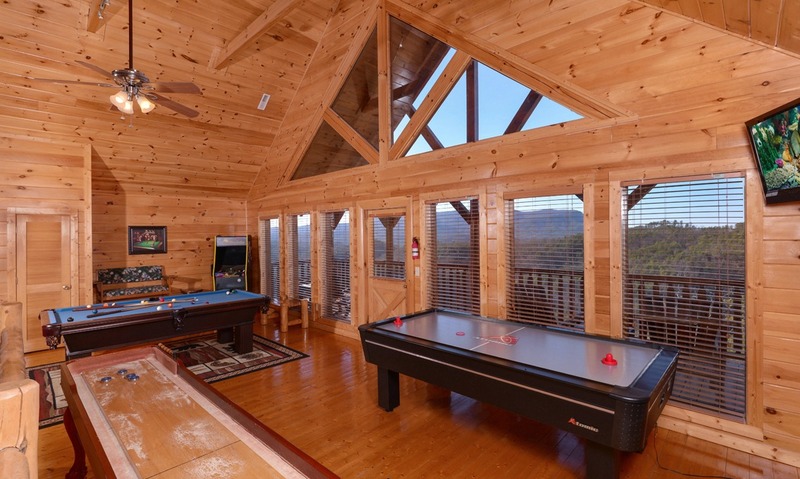 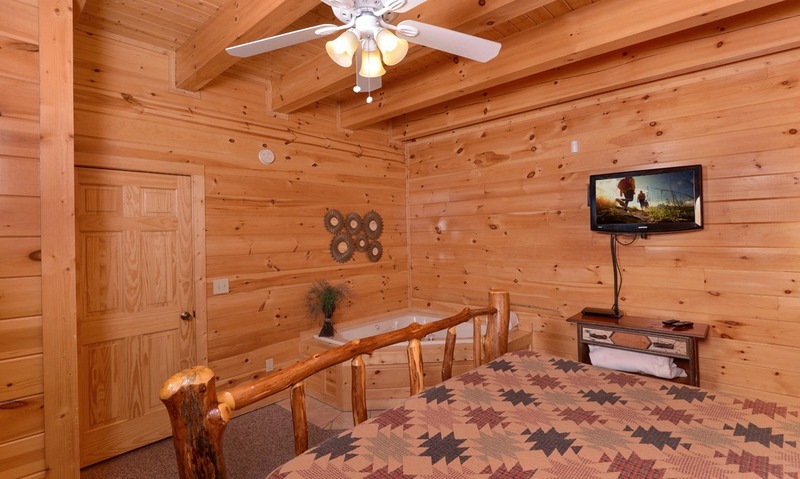 Sleeping up to 14 people, this cabin is great for taking in spectacular Smoky Mountain views from the outdoor hot tub, enjoying a fun movie night in the media room, or playing a rousing game of air hockey in the rec room. 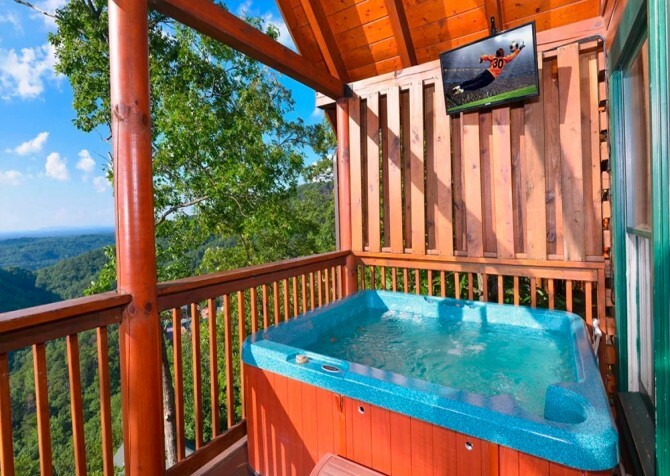 With these options and more, It’s All Good in the Smokies! 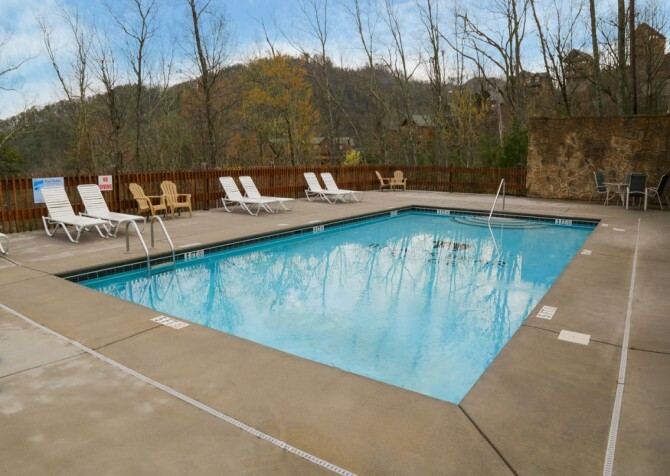 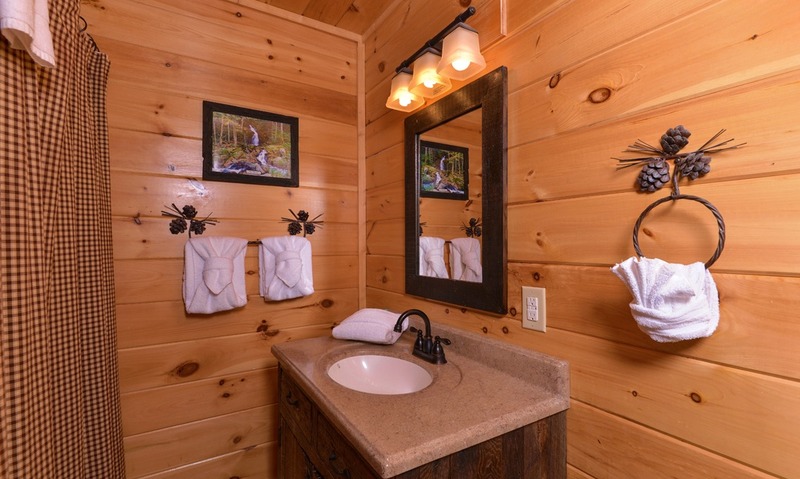 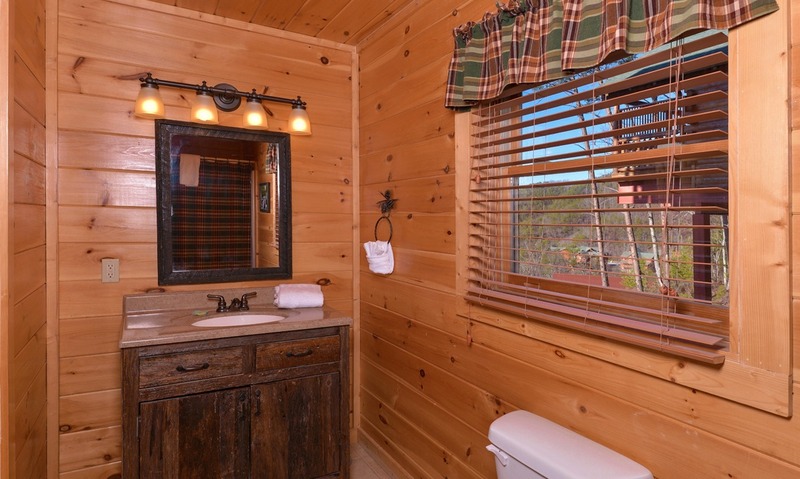 On top of all you’ll find inside the cabin, It’s All Good is just a few miles from downtown Pigeon Forge, keeping you close to all the attractions, restaurants, and shops that make a Smoky Mountain getaway so exciting. Ride mountain coasters, play and shop at The Island, ride coasters at Dollywood, hop aboard the trolley to explore downtown shops, or head to the Great Smoky Mountains National Park for hiking, biking, horseback riding, scenic drives, swimming, fishing, and more! 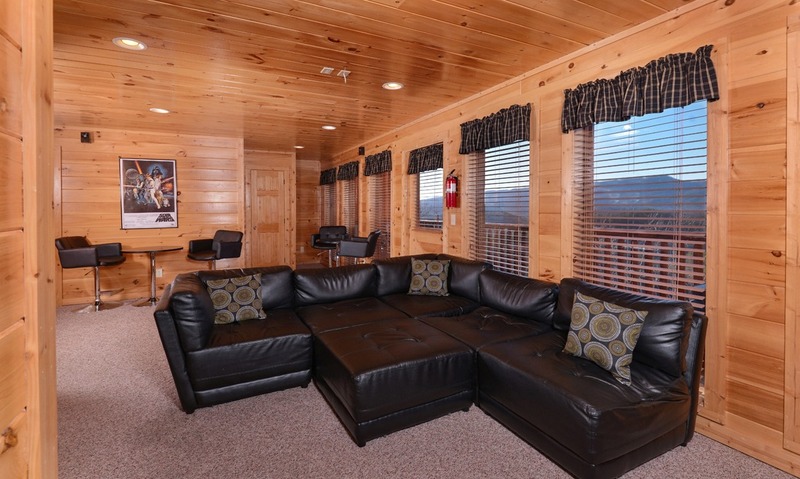 Right off the dining area, the cozy living room features a plump couch (doubles as a queen-size sleeper sofa) — perfect for a cat nap — and a love seat with a great mountain view from 3 large windows. 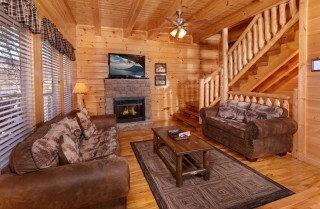 A matching wooden coffee table and end table are more than ready to hold as much coffee and cocoa as you can handle. 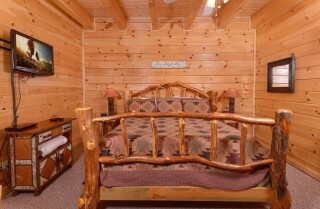 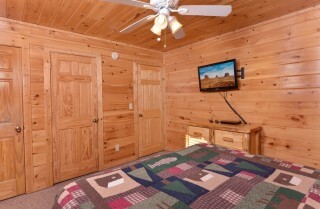 There is also a stone gas fireplace, a big screen TV, and a DVD player — great for movie night in the cabin! 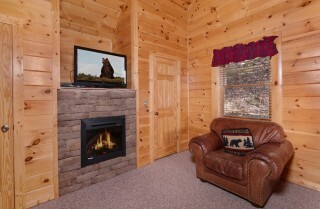 Imagine the perfect atmosphere for a romantic comedy, fun family movie, or holiday classic by the fire! 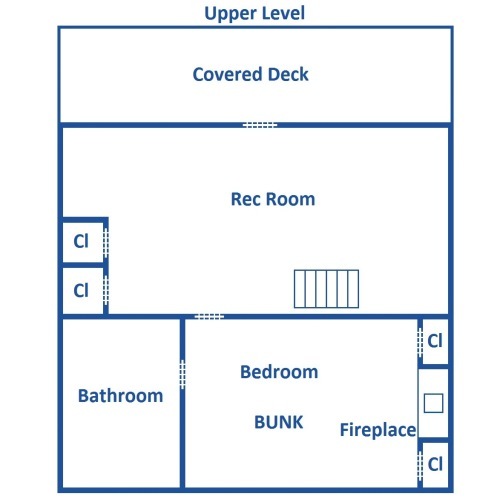 With an open floorplan, you can easily head over to the fully equipped kitchen, complete with a large refrigerator (ice maker and water dispenser included), a stainless-steel double sink (with a sprayer), and a bar area (seats 3) with extra counter space. 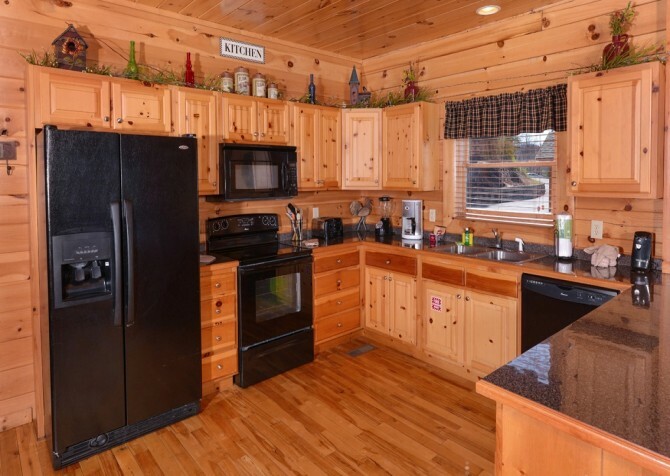 There is also an oven for grandma’s homemade biscuits, an over-the-range microwave for your movie-night popcorn, a can opener for an easy Italian supper, a toaster and blender for you’re a quick breakfast, a coffeemaker to give you your morning jolt, and a dishwasher to clean it all up. 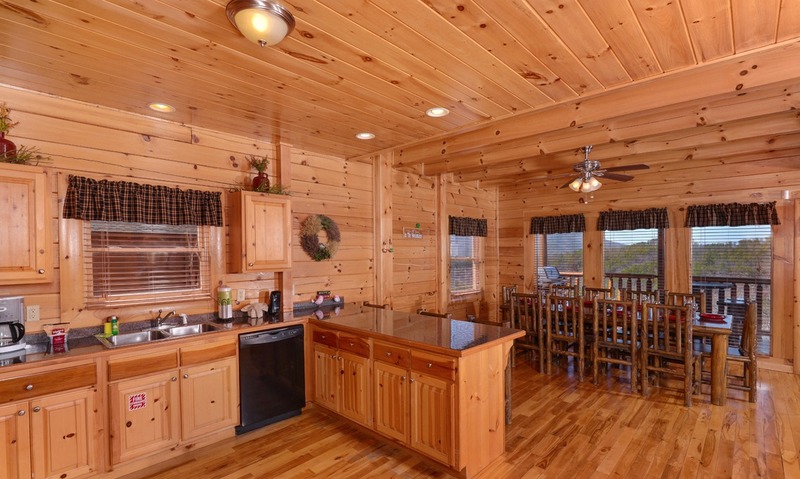 This kitchen is more than ready for any recipe you throw at it, so bring your apron and get ready to enjoy a beautiful mountain view from the back windows, too! Directly across from the kitchen, making it easy to serve up some grub, you’ll find the dining area with seating for 10. With a log table (matching the living room’s furnishings) and chairs, you’ll really get that cabin feel at every meal. 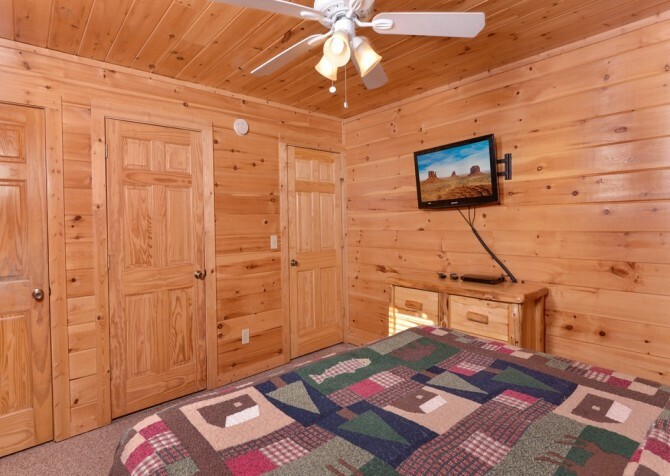 There is also a ceiling fan above the dining area in case a warm summer evening tries to creep in on your ice cream time. 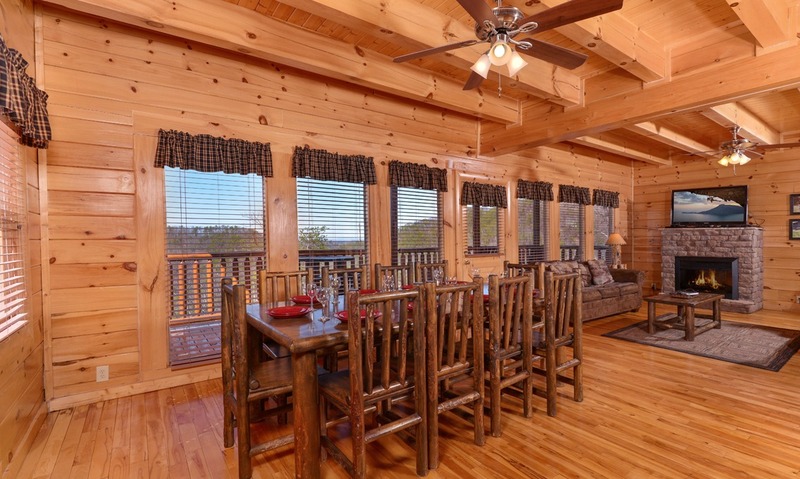 As if a fine meal weren’t enough, there are also 4 windows offering lovely mountain views as your mealtime backdrop. 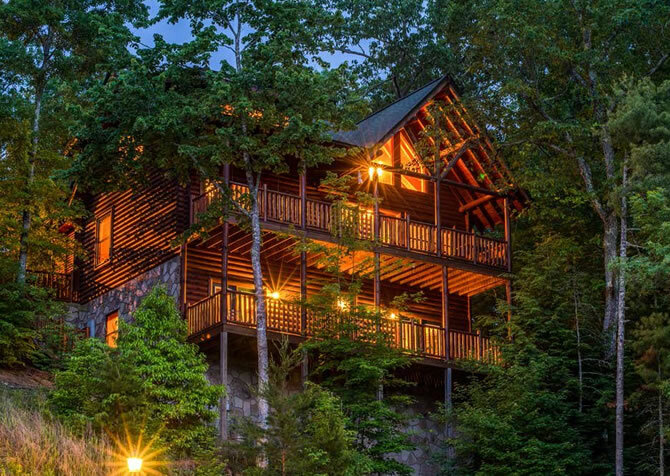 As important as eating is, food isn’t the only necessity on a vacation — sleep is, too. With your comfort in mind, this home has 4 cozy bedrooms, 3 with private bathrooms! Located on the entry level, the master bedroom hosts a king-size bed accompanied by 2 end tables complete with lamps (a good place to charge your electronics), a ceiling fan to keep you cool, a mounted flatscreen TV for your entertainment, and a bath with jets to give you that special spa experience. 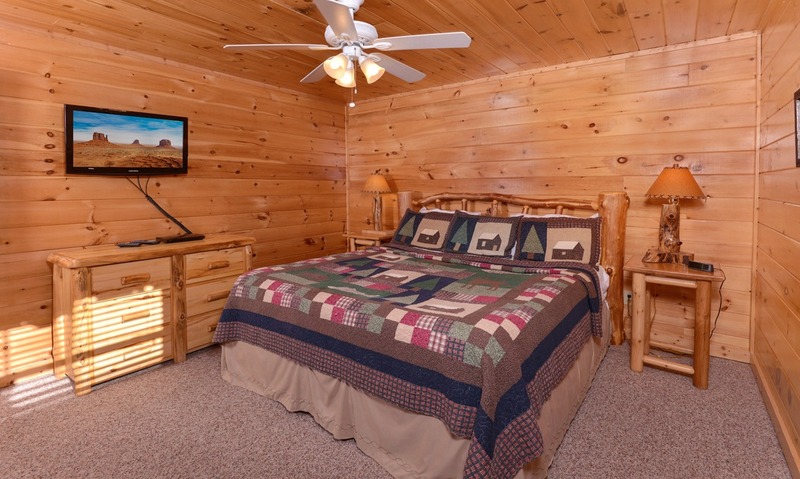 Head downstairs to visit 2 more bedrooms, each with a king-size bed, a mounted TV, a dresser, a convenient ceiling fan, 2 end tables with lamps, and an en suite bath to make life easier. 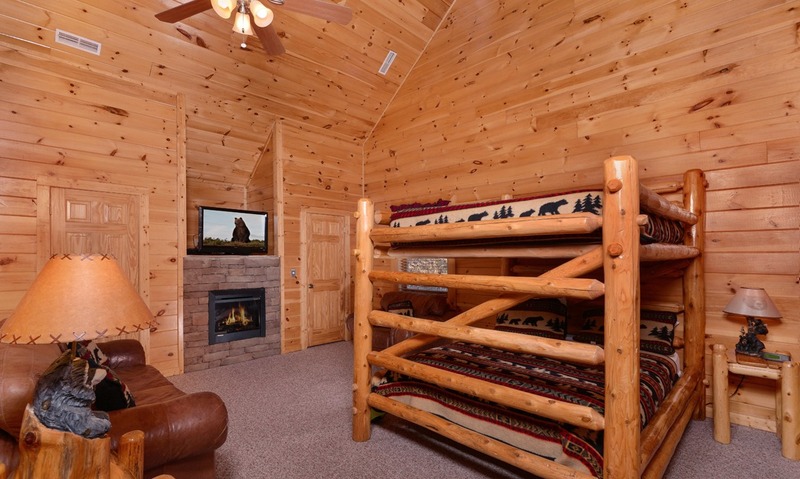 On the second floor, you’ll find a rather large open-ceiling bedroom harboring a queen-size bunk bed (with plenty of head room), a queen-size sleeper sofa, a matching arm chair, and a flatscreen TV over an electric fireplace. 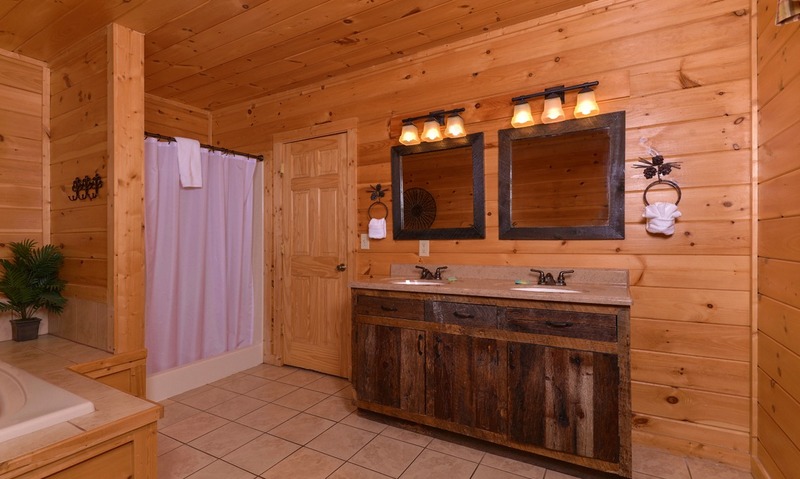 Since this bedroom accommodates the most people, its en-suite is the most spacious with a shower, a separate jetted tub, and a double vanity. If your kids — or your husband — go missing for a few hours, look no further than the ever-so-well-stocked rec room! As you climb the stairs to the second floor, you’ll first notice the pool table quickly followed by the classic arcade console. 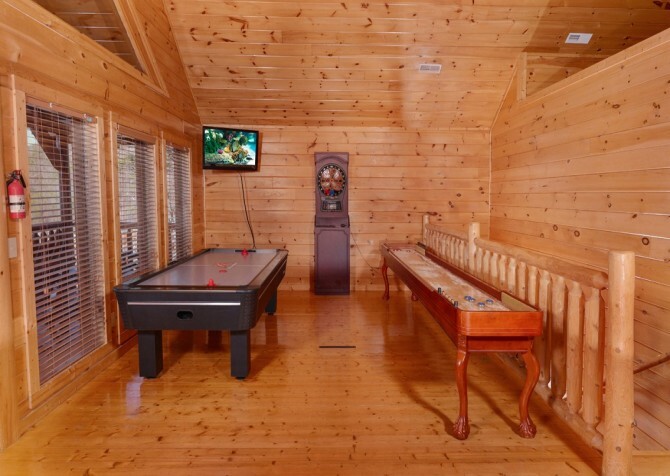 As you turn to the right, 3 more games will come into sight: air hockey, darts, and shuffleboard. There’s even a mounted TV for extra entertainment where all can see! 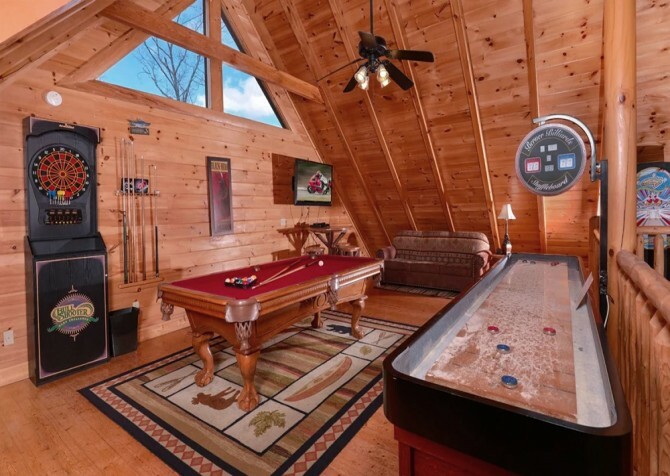 For those who just want to watch the merriful — or merciless — matches, seating is provided around the room — some even have drink holders! 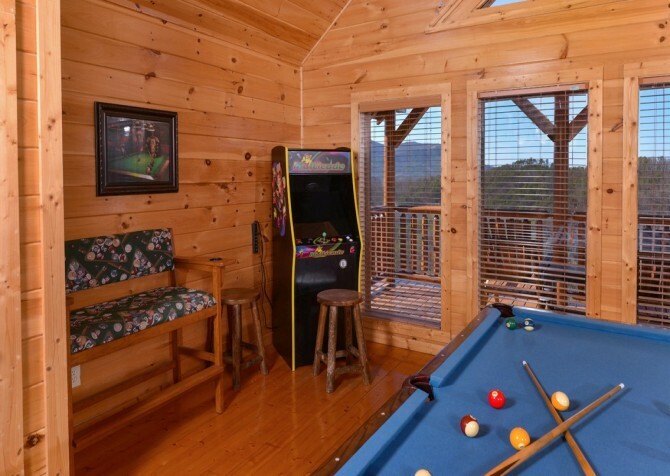 Look out the 6 large windows to the calming mountain scenery beyond to take your mind off your last round of defeat and prepare for your crushing victory in the next bout. As you head downstairs to the lower level, you’ll be greeted by posters of new classics like Titanic, Harry Potter (Harry Potter weekend in the cabin! 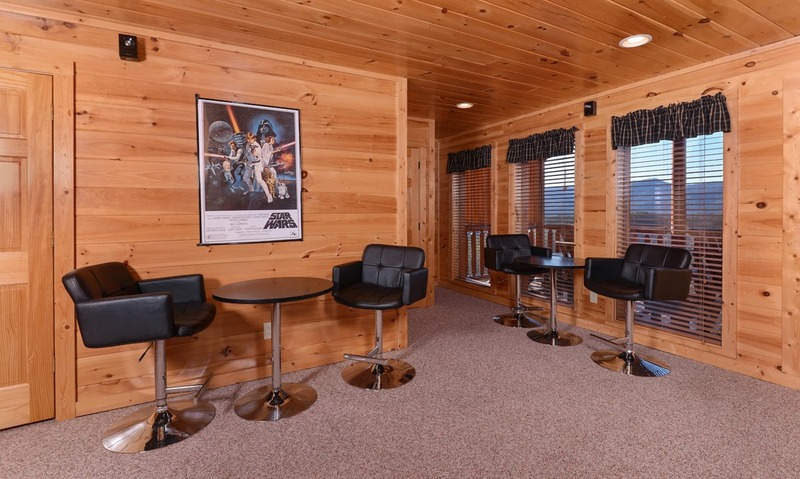 ), Pirates of the Caribbean, and Star Wars to get you in the movie-night mood! With recessed lighting, surround sound, a DVD player, a mounted big screen TV, and your popcorn from the kitchen, you’ll get to experience the theater life in your PJs. 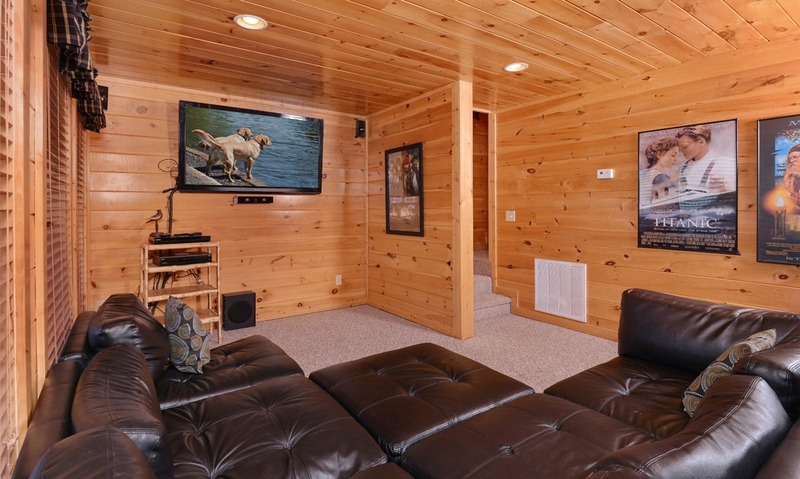 Feel free to rearrange the lounge-worthy sectional to suit your viewing preferences. Additionally, you can set up a dinner and a show with the bar stools and tables at the back. At the cabin’s entryway, you’ll find a covered front porch (only 4 steps up) with plenty of space so you unpacking will be easier. The flat driveway is paved as well and provides enough space to park up to 5 vehicles (motorcycle friendly!). 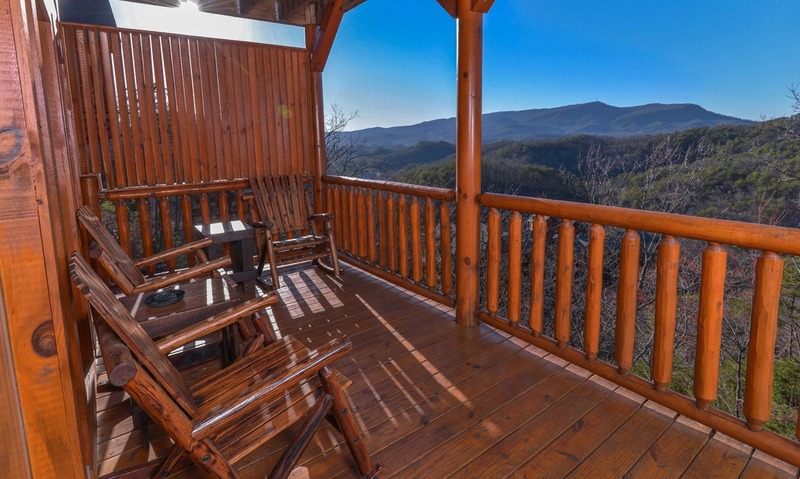 Set your hot cocoa on one of the outdoor side tables and rock away your troubles in a wooden rocking chair as you savor amazing views of the Smokies on one of the 3 covered decks! 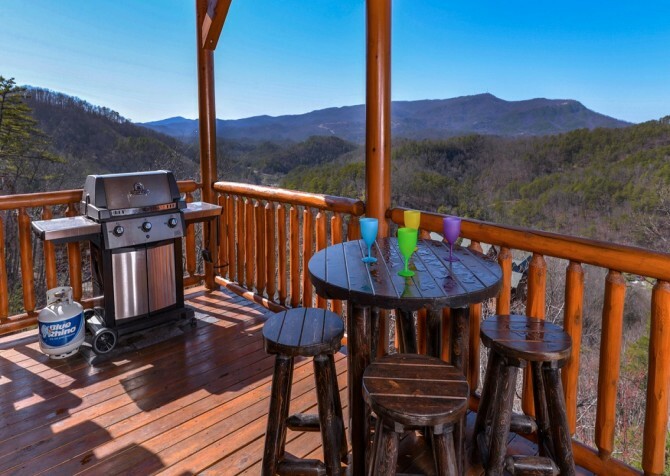 On the entry-level deck, you can use the gas grill to create a barbecue feast and serve it up — or eat it up — on the outdoor table with 4 matching bar stools. 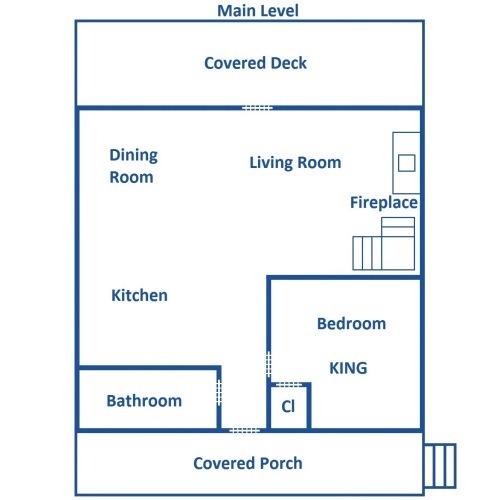 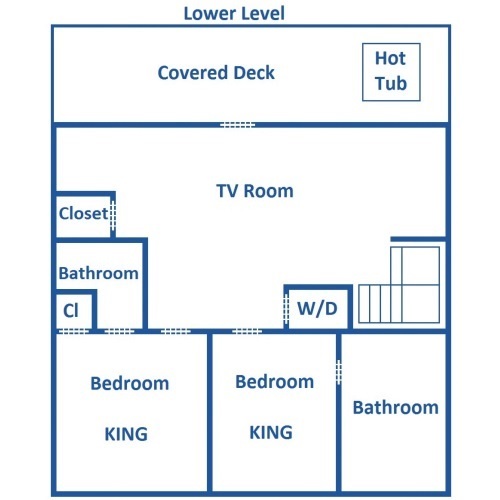 Head down to the lower level deck for a night soak in the hot tub (there are privacy walls for your added comfort). If the rec room is getting a bit rowdy, take a step outside onto the second-floor deck for a moment of peace with nature. As a bonus, this cabin comes with free Wi-Fi so you can happily binge-watch the latest Netflix releases or keep up with your favorite YouTubers. 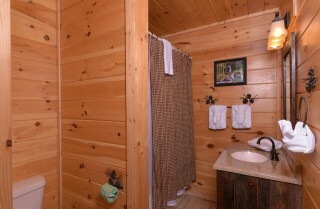 There is also a washer and a dryer to help you get more use out of your towels and washcloths throughout your trip. 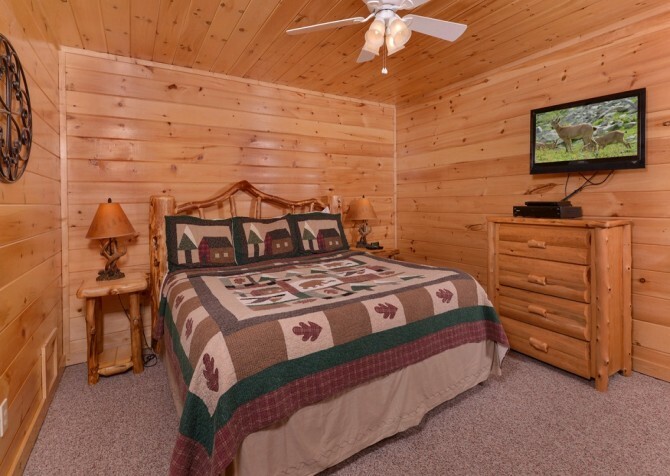 Being a pet-friendly cabin, you can bring your little pup with you and dish out tons of special treats — after all, you’re not the only one on vacation! And as part of the Black Bear Ridge Resort, this cabin has access to a community pool and a salon and day spa, so be sure to set aside some time to soak up some rays and destress those muscles — you deserve it! 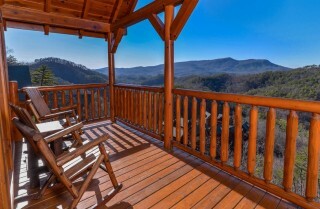 Ready for a thrill ride through the Smokies? 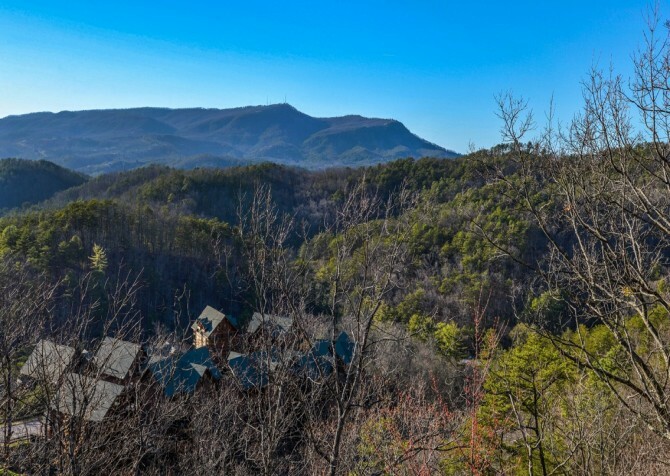 Look no further than the Smoky Mountain Alpine Coaster, the longest downhill ride in the United States — and you control the speed (up to 27mph)! 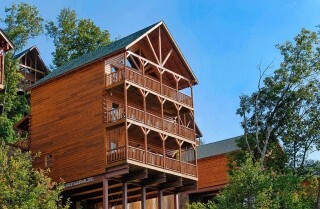 There’s nothing like a good day of eating, entertainment, and shopping! 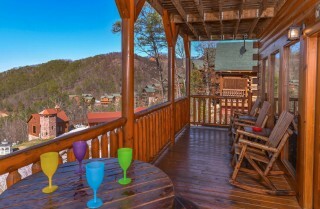 Head to The Island for delectable dining, live music, fun rides, souvenir shops, and more! 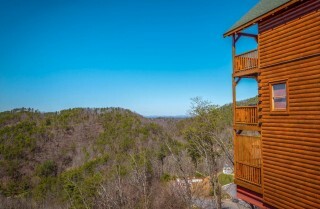 Time to let go of your fears — but not the line! 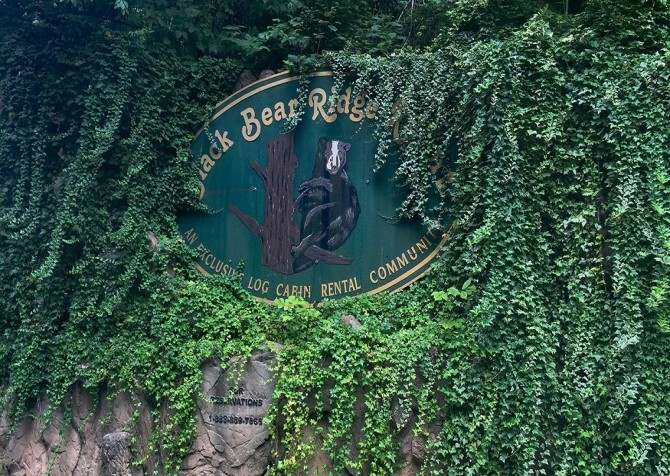 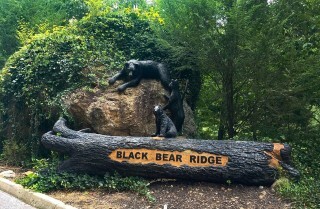 — as you zip your way through the Great Smoky Mountains for a nature experience unlike any other. "Every year our family gets together for the holiday weekend and this year we stayed with Cabins For You. 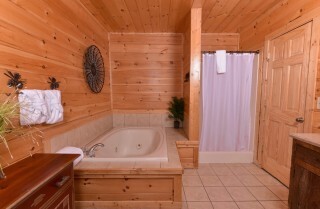 From the beginning we were delivered great customer service. Our vacation planner was personable, gave great correct information and was quick to respond. The house was easy to get to, great location, clean and perfect for our family. 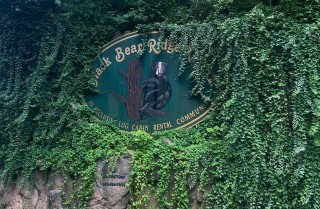 We will be back!! Thank you for the great customer service and perfect cabin!" 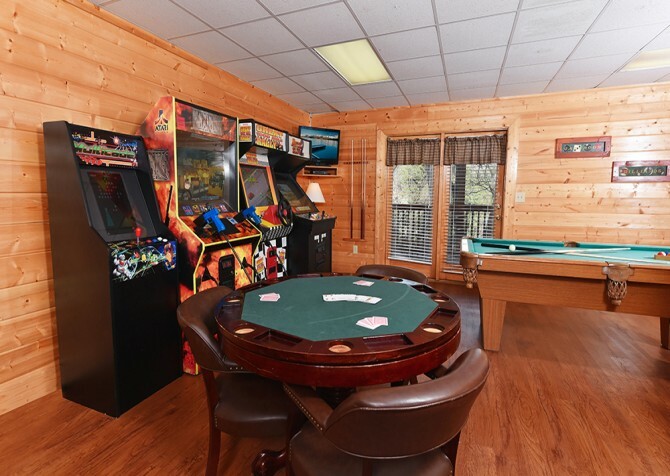 "Excellent layout for a group to meet and have space for various simultaneous activities--good for a group of multiple ages, it was comfortable inside with an unbeatable outside view---we hope to return there for another family gathering."